Mr Osei Kyei-Mensah Bonsu, Majority leader in Parliament and Member of Parliament (MP) for Suame Constituency has advised the electorate to scrutinise and access candidates very well before voting them as MPs for their constituencies. He said Parliament needed well-informed, well experienced and persons with the requisite knowledge to steer affairs to effectively represent the citizenry on the mandate of bringing development to their constituencies. 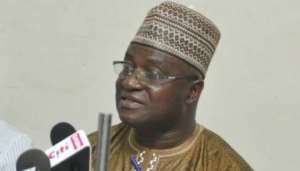 Mr Kyei-Mensah Bonsu said this in Tamale at the weekend during a Parliamentary constituency forum aimed at establishing closer links with the Legislature and the citizenry to ensure a better understanding of the institution. He explained in detail activities that take place in Parliament and that all MPs worked for the interest and development of the country and stressed that importance of peace and unity among the rank and file of citizenry since all MPs from the political divide related well. Mr Haruna Iddrisu, Minority leader and MP for Tamale South Constituency, the Majority leader,ten other leadership of Parliament including; the Deputy Clarks interacted with Assembly Members of the various electoral areas, students and the citizenry to educate them on the affairs of Parliament. Mr Kyei-Mensah Bonsu said MPs were not agents of development and advised the citizenry to desist from voting individuals into Parliament who used development as campaign messages to win elections, stressing that they represent, inform and enact laws to ensure that the national purse was protected from mismanagement. He indicated that, the three agencies responsible for carrying out development or ensuring development were the Presidency, the various Ministries and the District Assemblies. Mr Haruna Iddrisu, said the responsibility and the safe keeping of the national purse rested entirely on Parliament, which also ensured that the welfare of the citizenry was met. He said the core mandate of MPs was to speak to issues concerning the citizenry to ensure that their welfare remained paramount, which could be achieved by implementing the right policies to address the needs of the people.